Global Fire Suppression Market size was valued over USD 13 Billion for 2016 and the annual installation is set to exceed over 500 million units by 2024. Robust increase in fire hazards and accidents subject to poorly maintained electrical circuits, unsuitable housekeeping standards and availability of stock combustible materials including inflammable liquids or gases will upsurge the global fire suppression market size. As per International Rescue Services, more than 60,000 injuries and 20,000 deaths were caused due to fire in 2014. Increasing investments toward the development of environment friendly and advanced protection technology along with growing public concerns towards safety and security will embellish the market share. In 2015, government spending across Europe to support public safety from natural hazards was USD 278.07 million. Stringent government norms pertaining to occupational safety and loss of life & property coupled with rising adoption of extinguishers across industries including petrochemicals, mining and quarrying will propel the fire suppression market growth. The U.S. government established National Fire Protection Association (NFPA) codes and regulations to standardize the equipment’s and protection systems across the region. Growing awareness for protection measures along with stringent legislation towards building codes will stimulate the market. Increasing investment towards smart building technologies along with adoption of Industry 4.0 concept will further propel the business landscape. The British Automatic Fire Sprinkler Association (BAFSA) has established building code BS EN 12845:2015 to standardize the design, installation and maintenance of sprinklers in UK. Increasing expenditure towards safety primarily across industrial and commercial establishments will drive the fire extinguisher market. Varying capacity, diverse chemicals and portability are some of the key parameters which will make its adoption preferable over the forecast timeframe. Favorable government norms toward the installation of sprinklers in new and existing buildings will propel the fire suppression market. As per British Automatic Fire Sprinkler Association, new residential buildings over 30 m high must be fitted with these products to meet the safety standards. Commercial sector is projected to witness rapid growth subject to rising investments toward the construction of offices, educational institutes and hospitality industry. Rapid industrialization and urbanization in developing nations coupled with increasing office floorspace will foster the fire suppression market. In 2015, demand for office space in India rose to 28 million sq. feet from 23 million sq. feet as compared with 2014. Industrial fire suppression market is set to grow at over 3% by 2024. Strict regulations pertaining to public safety coupled with ongoing expansion of industrial base will positively influence the business landscape. As per NFPA, in 2014, U.S. reported for an average of 37,000 accidents from industrial properties, majorly occurred due to structured fires. 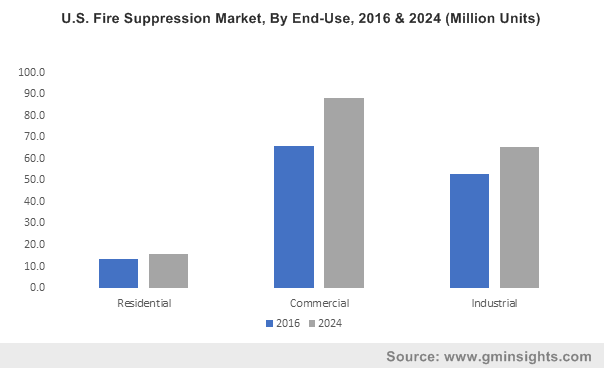 U.S. fire suppression market is predicted to exceed annual installations of 150 million units by 2024. High acceptance of building safety codes along with increasing hazards and accidents will stimulate the product penetration. Positive macroeconomic cues along with increasing consumer awareness toward adoption of safety equipment will propel the product penetration. According to National Fire Protection Association, in 2015, the U.S. had reported 1,345,500 fire accidents. UK market share is set to witness growth over 3% by 2024. Stringent government policies and norms toward safety across industrial, commercial and residential sector along with adoption of smart building technologies will drive the business outlook. The UK regulation states that all premises with heavy electrical equipment must have 5 Kg CO2 extinguisher installed. China market is set to reach over 80 million units by 2024. Expansion of manufacturing industry coupled with increasing investments toward advanced building technologies will propel the business outlook. Stringent government norms and policies for building a safe and healthy work environment will fuel the business landscape. The Article 13 of Fire Protection Law of China mandates the use of protection systems in all commercial, industrial and residential building across the nation. Government measures to reduce natural hazards along with increasing investment towards commercial construction will drive the UAE market. The government of Dubai has imposed strict rules of penalty of up to USD 136.13 for non-acceptance of fire safety standards. 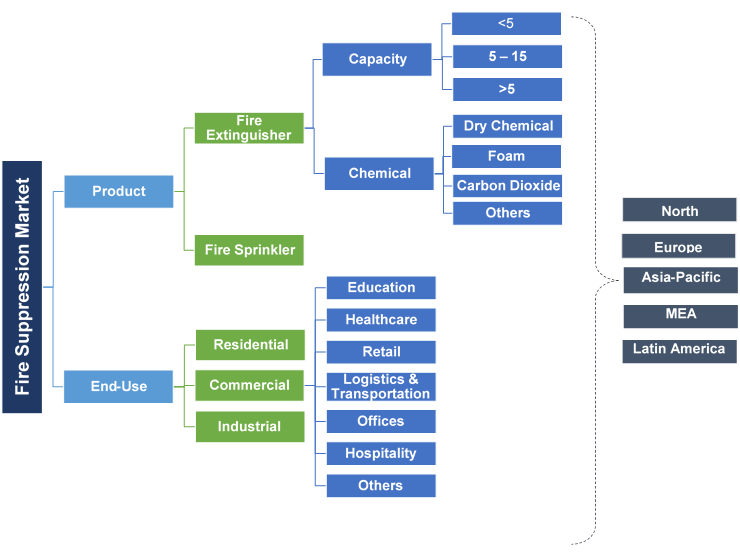 Eminent players in fire suppression market include Amerex Corporation, TYCO, National Fire Equipment Ltd., United Technologies Corporation, Master Fire Preventions Ltd., Minimax, NAFFCO, Lubrizol, Firetronics, Bristol Fire Engineering, SFFECO and Halma PLC. Major players are focusing on product developments and introduction of advanced technologies in existing product line to gain the competitive advantage. In 2015, Tyco introduced a new ESFR pendent sprinkler for warehouse and storage applications with an objective to expand its product portfolio. These systems are adopted to prevent fire accidents across residential, commercial and industrial applications. Wet agents, dry chemicals and hybrid combination are primarily deployed in accordance with their application penetration. Extinguisher consists of hand-held cylindrical vessel which adopts high pressure to release the suppression chemical whereas sprinkler adopts water flowing through pipes that sprinkles within 50 feet area.